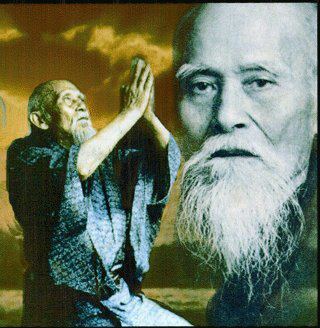 Aiki principles and secrets of Aikido can be of great benefit in developing your skills. Unfortunately many instructors do not include it in their traditional classes. The limited time they have available is usually devoted to the study of techniques. to practice the art of peace. and that is the place to train "
Aikido combines practical self-defence movements with an emphasis on an extension of mental ki energy. The central philosophy teaches how to take responsibility for not inflicting unnecessary damage to an attacker. At the core of the art is Ki and Hara. Ki is the inner energy which you possess but rarely develop, that is stored in the hara, your centre of gravity in the lower belly. The aim is to focus your mind at this point to experience a calm mind. 1 - Misogi (Purification of Mind and Body) Misogi deals with methods of purification of mind and body which are Essential for a Healthy Lifestyle... pure air and water, organic food and nutrition, beneficial exercise, good sleep, relaxation, etc. 2 - Kotodama (Chanting the Sound Spirit) The Kotodama U, which is the origin of spirit and substance, divides into two. Kotodama A, which is yang/fire energy goes up to heaven, and Kotodama O, which is yin/water energy goes down to earth. The opposing force that holds the two together between heaven and earth - ki, chi, prana, magnetism, vital life force. Vibrations of sound have the Power to connect spirit and form. These key secrets of aikido hold the essence of the art. Study and practice these to boost your technical skills, and improve your life! Aikido Success Blueprint - fast-track your skills to peak performance levels with this massive collection of knowledge. Including tips on mantras and chanting of power words. your journey to Aikido mastery - PLUS more free bonuses! Are you new to Aikido or been practising for years and are struggling to make your techniques work? Maybe you are an instructor who finds it difficult to control those 'Resistant' students? Is your Sensei reluctant to pass on secrets of Aikido or pressure points of the masters? This is probably because they don't have time or were not taught by their Sensei. Do you want the best information around on the most effective use of pressure points by one of Europe's top experts? This can be used to greatly improve Your Aikido techniques. Russell Stutely has been acknowledged as Europe's Leading Authority on pressure Points. He has been instrumental in dragging traditional arts into the 21st century. Russell was a columnist for Britain's most prestigious magazines, Martial Arts Illustrated, Traditional Karate and Combat. He is in constant demand on the seminar circuit, teaching his proven methods of the correct use of Pressure Points and Power in street self defence. Tony's unique Self Defence Seminars that are held in Bognor Regis, West Sussex UK cover many of Russell's methods for super Fast Results!